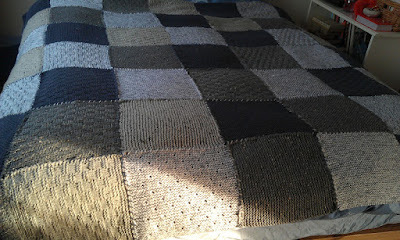 I spent most of Sunday adding the last row of squares, and sewing in the loose ends of wool. It's been on my bed unfinished for quite a few weeks, but I swear it's even warmer now for being finished! Love the texture here! Haha Must be giving a warm glow then to have it finished! How great you have finished this blanket! It's so beautiful and will warm you when we are waiting the spring. Here it looks like it might not come this year - it's raining, raining and then raining again! Hey, a finish is a finish! That looks absolutely beautiful sweetie! I really want to do a nice blanket like this - how long did it take you to make? It's beautiful well done on finishing it, it must be so cosy.